We have an extra special event planned for this Art Walk Thursday, tomorrow June 9th. 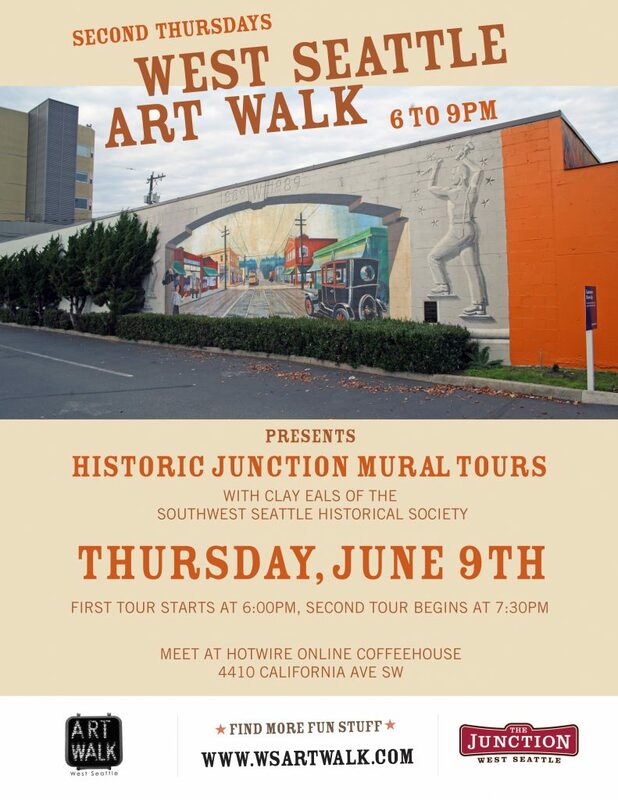 Stop by The Junction for Historic Mural Tours with Clay Eals of the Southwest Seattle Historical Society! Learn more about these scenes of local history and how they came to grace the walls of our businesses here in The Junction. Longtime West Seattleites may look at them as treasures that illuminate our past. Newcomers may wonder how they came to be. But no matter how long you have lived here, you likely have noticed the increasing deterioration and attrition of the Murals of West Seattle. The Murals of West Seattle project was led by longtime local business leader Earl Cruzen in 1989-1992. Earl was a persuasive pied piper in the West Seattle business community, drumming up bare walls, funds from generous building owners and the key ingredient of enthusiasm to bring the project to fruition. Earl recruited world-class muralists whose work adorned the coastal Washington towns of Long Beach and Ilwaco and the former Canadian lumber town of Chemainus, north of Victoria, B.C. I was part of Earl’s team (as was the late graphic artist Moe Beerman) for this truly exhilarating project. As president of the Southwest Seattle Historical Society board I helped supply vintage photos for the muralists to interpret and render colorfully on the walls of The Junction and beyond. Part of the excitement was the ability for everyone to watch the murals come to life and to interact with the visiting muralists as they did their summertime work day after day. The result was 11 unique art pieces, and for more than a quarter-century, the murals have brought to life the rich history of much of the Duwamish peninsula – the very definition of tangible community-building. To read Clay’s complete blog post on the murals and the decisions facing the neighborhood in preparing to preserve and protect them for the future, please stop by the Southwest Seattle Historical Society website. WHO: FREE and open to the public! WHEN: First tour begins at 6:00pm and the second starts at 7:30pm.